For tonight's recipe, instead of preparing something focused primarily on taste, my goal was some creative design and aesthetics. 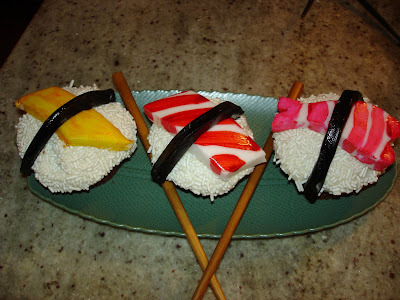 I decided that I wanted to prepare cupcakes that had the look and feel of sushi and sushi maki rolls. 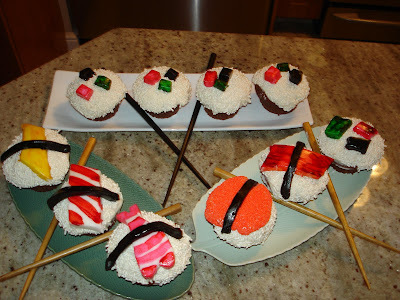 It was an attempt to artistically combine two of my favorite foods - sushi and cupcakes. 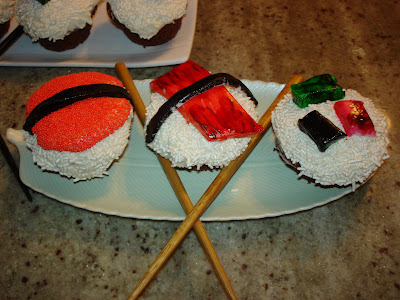 I'm not the first baker to attempt to make sushi cupcakes, but I decided to prepare sushi cupcakes using my own original design. I prepared two types of sushi cupcakes to make my 10 piece Sushi Deluxe: a five piece maki roll (california roll) and 5 pieces of sushi on rice (salmon, tuna, tamago (egg), flying fish roe and shrimp). There is a line when food borders on art. I realize tonight that I have definitely crossed that line. Art has always been one of my passions - I took AP Art in high school and have always loved painting in acrylic, oil and watercolor - my paintings usually focus on flowers though. Tonight, I put those painting skills to good use in painting the fish for the sushi cupcakes on rolled fondant, using an array of gel based food colors. This is the first time I have ever used fondant, as it is more commonly used in creating ornate and elaborate wedding cakes, such as by famed wedding cake designers like Sylvia Weinstock. Tonight, I learned from this project that rolled fondant is an incredibly flexible and adaptable medium, which was quite easy to work with and can allow you to do almost anything when it comes to decorating baked goods. In the future, I plan on creating a decorative cake made out of painted, rolled fondant. Dip each of the cupcakes in a bowl with white jimmies. This will resemble the sushi rice. As a possiblke alternative, you could use sweetened coconut instead. To make the tuna, tamago, shrimp and salmon, I rolled out a large piece of fondant using a rolling pin to the desired thickness and painted using my gel-based food colorings (which didn't require too much dilution). I made bands out of the fondant and painted them black to resemble the seaweed. Of these fish, I think the shrimp is my favorite. For the flying fish roe, I added some extra frosting (about a tablespoon) in the middle of the sushi "rice" and dipped that in the red/orange nonpareils. To make the maki roll - a california roll - I cut small squares out of the fondant, three squares for each of the five cupcakes. I painted one green, one orange and one black. I pressed the fondant into the cupcakes. One of my favorite parts of this project was setting the sushi up for photographs. My husband proposed to me several years ago, the first time we prepared homemade sushi (of the actual fish variety), so I have quite a few sushi sets we subsequently received as gifts, and used them to present the sushi photographically, with the accompanying chopsticks. 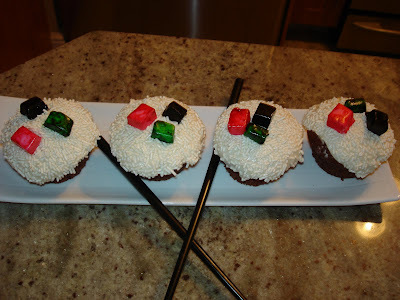 If you are interested in reading my post on how to prepare actual sushi, rather than my offbeat cupcake sushi, click here. I really enjoyed this project immensely, in part because it was a very art intensive project that allowed me to combine my painting with my food and culinary passions. I think these cupcakes were not as hard to make as I thought they would be, but came out exaclty as I envisioned. I hope to do additional baking projects in the future that bring out my artistic side. Just goes to show that food can and should be treated as an art form, just like painting or sculpture when executed properly. In addition, I love all the bright colors and the textures of the cupcakes. Since starting this blog, tonight's post was one of my favorites both to execute and to write about. I hope I made Henri Matisse, my favorite artist, proud. Oh my goodness--I have never seen cupcakes like these! Your sushi cakes are BEAUTIFUL!!!!!!! Adorable! I don't actually care that much for seafood, but I could really get into this sort of sushi. Inspired, brilliantly executed and so tongue-in-cheek! I love it!! You're clearly very talented... well done. Seriously cute! I love this idea.